Oculus VR's announcement that it has acquired Surreal Vision isn't necessarily the sort of thing we'd typically cover. But its advanced work in the field of real-time 3D scene reconstruction has the potential to dramatically impact the future development of the Oculus Rift headset by enabling "a new level of presence and telepresence, allowing you to move around the real world and interact with real-world objects from within VR." "At Surreal Vision, we are overhauling state-of-the-art 3D scene reconstruction algorithms to provide a rich, up-to-date model of everything in the environment including people and their interactions with each other. We’re developing breakthrough techniques to capture, interpret, manage, analyze, and finally reproject in real-time a model of reality back to the user in a way that feels real, creating a new, mixed reality that brings together the virtual and real worlds," the Surreal Vision team said in a statement. "Ultimately, these technologies will lead to VR and AR systems that can be used in any condition, day or night, indoors or outdoors. They will open the door to true telepresence, where people can visit anyone, anywhere." Examples of what the three Surreal Vision founders have worked on previously can be seen on YouTube, with exciting titles like Dense Tracking and Mapping in Real-Time, Dense Planar SLAM [Simultaneous Localization and Mapping at the Level of Objects], and DynamicFusion: Reconstruction and Tracking of Non-rigid Scenes in Real-Time. It's not necessarily the sort of stuff that would immediately suggest a looming revolution in gaming, but the potential is enormous. "For virtual reality, the accuracy and quality of the continuously updating 3D reconstruction must be near flawless, which is a requirement almost no other modern computer vision problem faces," the statement says. "When we cross these seminal thresholds, users will perceive the virtual world as truly real—and that is the experience we’re driving toward." In related news, earlier this month the relatively steep Oculus Rift system requirements were revealed. 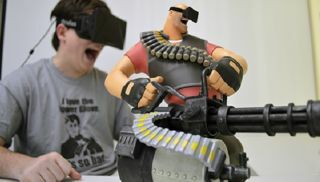 The headset may run on a lower-spec system, but Oculus Rift Technical Director Atman Binstock said effective virtual reality is all about "comfortable, sustained presence," which an underperforming system won't be able to provide.